Safety and security are important elements in any community, but there can be an uneasiness that arises in certain environments when that involves the presence of security officers. That’s why Dalhousie’s Security Services team has taken a different approach to improving safety in its student residences, launching a program emphasizing familiarity rather than foreboding. The Residence Community Security Officer (RCSO) program first got up and running as a pilot in January 2018, before an official launch in the current academic year. 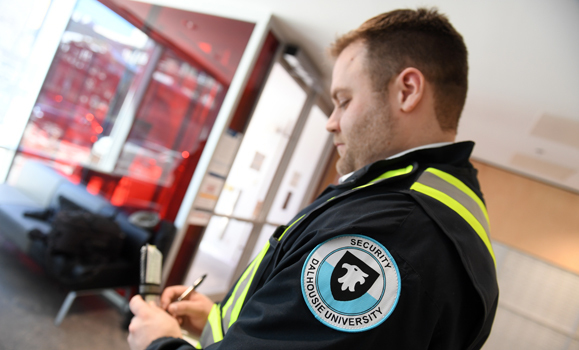 A joint initiative between Dal Security, Student Affairs and Residence Life, the program aims to provide residence staff and students with a familiar security officer they can trust and comfortably approach. “It gives the students somebody they are used to seeing, not just when the bad things happen, but somebody who they can be comfortable with,” says Adam Davis, a security officer and the first RCSO at Dal. All Dal’s Halifax residences are currently involved in this program. “The RCSO is available as a resource to all students and residence assistants living in residence,” says Davis. Since its launch, Davis has established significant relationships with the residence staff and students. The program has received great feedback from students. In surveys, students replied that the program made them feel “more safe and welcome in residence,” with one RA commenting how it was, very helpful to have a member of the security in the building to deal with immediate issues.” Residence Life Managers have shared that they feel more supported when the RCSO is on duty and they have a more streamlined connection to the wider Dal Security network. While timing the introduction of a unique program like RCSO in the middle of an academic year led to a bit of difficulty in perceptions of the program as “reactionary,” Davis says understanding of the program has since improved with the help of social media and community outreach. “Building relationships goes a long way in promoting safety,” he says. To ensure continuity among the security staff, Davis frequently takes another security staff along on RCSO shifts. “Across each of the four patrol shifts, we have one dedicated security officer (Resident Support Officer), they shadow along with me, and on days when I am not here they can step in, not quite to the same level, but with the same familiarity with the community, and that has been a big success,” he says.